For those of us who deal with periods and all the baggage that inevitably arrives with them each month, it can be difficult to avoid the occasional period-related disaster. In other words, I don’t think I’ve met anyone who gets a period without some horror story or another. In a time when dialogue about topics traditionally considered taboo is opening up, I’ve found people are increasingly ready and willing, even eager, to talk about periods. Perhaps in conjunction with that change in conversation is the emergence of the period-tracking app Clue: an app that saves both lives, and underwear. Clue found its way into my life just a few months ago, suggested by my good friend Chloe Thorburn ’20. Intrigued but slightly skeptical at first, I downloaded it and checked out a couple of the functions. First and foremost, the app is discrete in name and design, so if someone’s going through the apps on your phone, they won’t notice immediately that you have an app entirely devoted to your period (not that that should ever a bad thing). Clue is super user-friendly. You start off by inputting a bit of information about yourself, like height, weight, age, and your best guess as to the duration of your cycle. Clue then estimates the time of your period and fertile window so that you know when you can generally expect it to arrive on your doorstep. 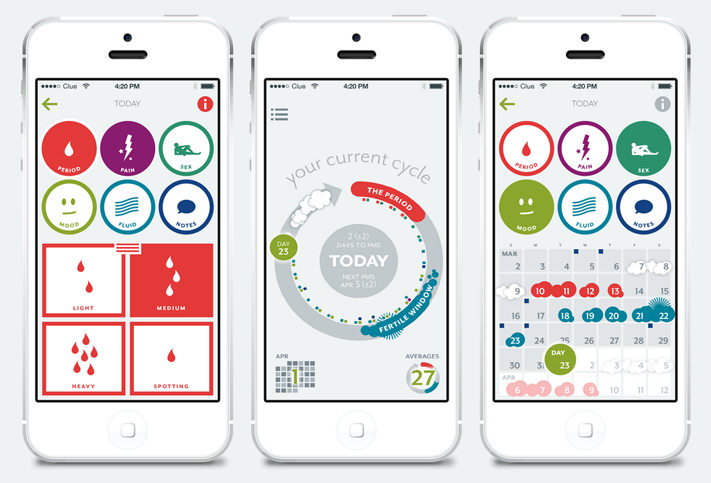 Clue also has an algorithm that allows it to predict your cycle more accurately as you input more and more information about your periods over time. Simply put, like the tell-tale sign in a science fiction movie that artificial intelligence is about to totally demolish the human world, Clue learns and adapts. Clue also has options for you to input information about each day of your period, like heaviness of bleeding, symptoms of PMS, and even the status of your hair (is it greasier than usual or looking amazing?). All this information is used to get a better picture of you and your cycle so Clue will be increasingly better at predicting it in the future. Clue also has a tab called “Cycle Science” that explains the scientific reasons behind asking you to input so much data. For example, Clue explains that the app tracks hair because “skin and scalp change in response to hormonal variations occurring throughout your cycle.” Understanding this information keeps you updated on your reproductive help, as well as help you plan ahead, ensuring you have the necessary supplies when you need them. I talked about the app with Thorburn, who notes that she’s been a fan since she first downloaded it and loves a number of the app’s features. Along with the period calendar, Clue also sends out emails that give an overall assessment of your reproductive health after you’ve inputted data about six cycles. The email gives you your average cycle and period length and the average variation in your cycle. It simply says whether or not your cycles are in the expected range and if you should consider talking to your health care provider. In essence, the app is a seriously useful tool for understanding the way your body works. Aside from all of those features of Clue, the app also lets users share their cycles with friends, and there’s a tab in the app that neatly arranges your friends’ cycles. This is a great tool for understanding why you may be syncing up with someone, but it’s also just a nice way to stay connected to people you care about. Maybe you see a friend’s period is coming up so you grab a couple bars of chocolate from RiteAid, or pack a couple extra tampons in your backpack. Maybe you see that they generally PMS for a few days before their period, so you make sure you have some Advil in your bag. In my personal experience, having a group of friends who are all on Clue is actually really fun because it reminds me that I’m not alone in this, and it makes something that can feel pretty terrible into a something I can freely talk and joke about. “I personally like the community feeling of [sharing data with friends], because when you’re on your period, it feels so terrible, and it’s really shameful. You’re embarrassed because you don’t want to have to tell anyone, so sharing your data with your friends really puts it on the up and up,” Thorburn noted. I took an unofficial poll in the WesAdmits Class of 2020 Facebook group regarding the widespread use of Clue on the University’s campus. Of the 61 responders, 36 people didn’t know what Clue was, and 21 knew what Clue was and used it regularly. I’m assuming that there are many more people on campus who haven’t heard of the app, but it’s nice to know that its use isn’t limited to my small group of friends. Likewise, I asked students to tell me about their experiences with the app, and I received a positive response from a student who prefers to remain anonymous. Whether your period is regular or not, Clue is a user-friendly and affirming app that puts the science of your period and reproductive health directly into the palm of your hand. I’d strongly recommend its use, both to avoid sticky situations and to keep you informed.